Houghton Mifflin Harcourt, 9780618448333, 384pp. E-mail and computer keyboards may have replaced dictation and typewriters in the business world, but the importance of clear and effective written communication has never been greater. In her all-new book, business-writing expert Sheryl Lindsell-Roberts offers practical advice on writing messages guaranteed to get results. Drawing on her experience leading writing workshops for Fortune 500 companies, Lindsell-Roberts walks the reader through a variety of letter-writing exercises and shows how a well-crafted message can make any writer stand out in the crowd. Getting from a blank page or screen to a results-oriented message is easy with Lindsell-Roberts’s proven Six Step Process. And numerous tips and reminders help make the central point that a successful message should always focus on what the primary reader needs to know. 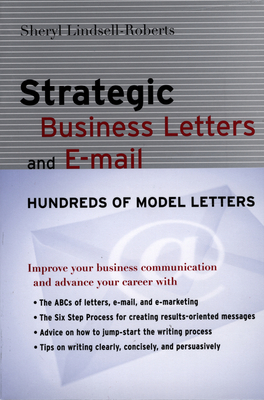 Best of all, Strategic Business Letters and E-mail is designed to save the user time and effort. Specific chapters on such areas as sales and marketing, customer relations, and personal business offer hundreds of sample letters, memos, and e-mail messages that can be used verbatim or with minimal alteration to fit a particular circumstance. Opening this invaluable book is the first step to jump-starting effective business communication. SHERYL LINDSELL-ROBERTS runs business-writing and e-mail seminars throughout the country and is the author of twenty-three books, including the popular Strategic Business Letters and E-mail, Mastering Computer Typing, Revised Edition, and 135 Tips for Writing Successful Business Documents.